Along the back roads off the I-5 corridor, the changing season is apparent with brightly colored leaves scattered on the landscape and fog filling the valley floor. Not so obvious to the roving traveler is the hustle and bustle that has now moved from the vineyard to the winery as crush continues. At AlexEli Vineyard in Molalla, vintner Phil Kramer works diligently like the rest of the wine industry, but for him, this vintage is a lot different than the rest. 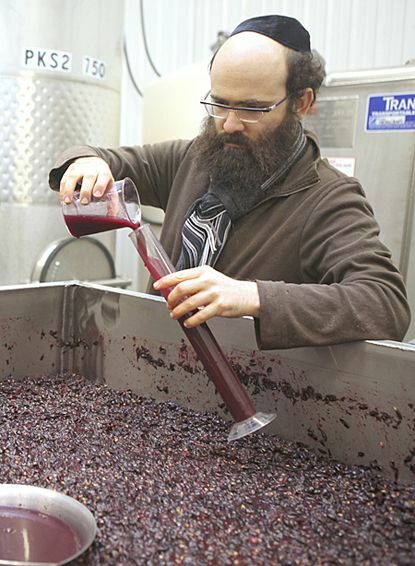 He’s making a type of wine like no other in Oregon: a kosher Pinot Noir. Kramer, who co-owns the vineyard with his mother, Anita, purchased the 18-acre estate four years ago and has been producing wine ever since. From the building’s industrial exterior with large solar panels on the roof, one would never guess the orthodox process taking place inside, but for Kramer, 28, he’s quite familiar with kosher products. His extended family — many located in Milwaukee, Wisc., Kramer’s hometown — is the big reason for making such a distinct and hard-to-find product. For those not familiar with the term, “keeping kosher” means following regulations of Jewish dietary law. For wine to be considered kosher, Sabbath-observant Jews must be involved in the entire winemaking process, and any ingredients used must follow the strict guidelines. For example, wine that is described as “kosher for Passover” must have been kept free from contact with grain, bread and dough. And the glue used for storing the wine in barrels does not contain any gluten. Knowing all the details, and the fact he would have to find a Rabbi to oversee the production, Kramer put off the idea for a couple years. He also wanted to fine-tune his winemaking and growing prowess before starting such a project. Kramer practices sustainable farming and believes strongly in minimal input and practices what he calls “beyond organic,” in his vineyard. While AlexEli is not certified, he makes sure he uses the most natural products when farming. When it comes to winemaking, he was immediately smitten with and passionate about the process after completing his first vintage in 2008. “I really care about the fruit and the wine,” Kramer said. “It’s like a drug habit — I think about it, worry about it, and I don’t even drink that much,” he explained. 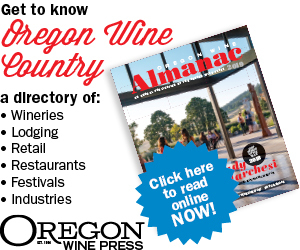 It’s no coincidence that AlexEli is located in one of the world’s finest winegrowing regions, the Willamette Valley — specifically, the East Valley. Kramer says he chose this region in part because of the area’s growth, and he hopes to expand his production of kosher varieties in the near future. AlexEli started production of its first kosher wine in October 2010 in cooperation with the Orthodox Union, one of the oldest Jewish organizations in the U.S., known for its kosher food preparation supervision service. Its circled U symbol, a hechsher, is found on the labels of many commercial and consumer food products. Kramer is not Sabbath observant, so he had to arrange for Rabbis to oversee the entire production after the grapes were harvested. Enter Rabbi Avrohom Perlstein, of Chabad Jewish Center of Salem, and Rabbi Menachem Rivkin, of Chabad Jewish Center of Hillsboro. Perlstein had overseen kosher food production in the past but was surprised to experience the level of involvement in producing wine. “There’s no stomping, but you get your hands dirty,” he said. While producing AlexEli’s kosher wine, Kramer, who is not allowed to touch the kosher wine until after bottling, was there to direct and look over the shoulder of Rabbi Perlstein, and looking over his was Rabbi Reuven Nathanson, a member of the Orthodox Union in Los Angeles and supervising Rabbi for kosher wine production on the West Coast. He is in charge of nine separate locations in the western U.S.
Aside from Rabbinic supervision and Shabbat-observant labor, to be labeled a certified kosher wine, the barrels and storage tanks must be kosher and everything that goes into the vintage must be kosher; this includes sugar, yeast for fermentation and fining agents. But the times are changing. A growing number of kosher wines are doing well in blind tastings and kosher wineries are appearing in regions around the globe. And now AlexEli’s contribution helps to expand its presence and bring it to Oregon, where approximately 1 percent of the state’s population is Jewish. Kramer’s kosher Pinot Noir will retail around $32 a bottle. About 182 cases will be ready in early February 2012 and available to buy in the AlexEli tasting room in Molalla. When it comes to making kosher wine, this sentiment is even more heartfelt.